With the final stages of the Euro 2012 tournament about to begin, millions of people the world over will spend the immediate future glued to their television sets. Likewise, with the cost of electricity spiraling ever upwards, millions of people the world over will spend the immediate future shelling out increasingly ridiculous amounts of cash just to keep their lights on. If only there were some way to utilize the fervent passion of soccer fans to generate electricity. 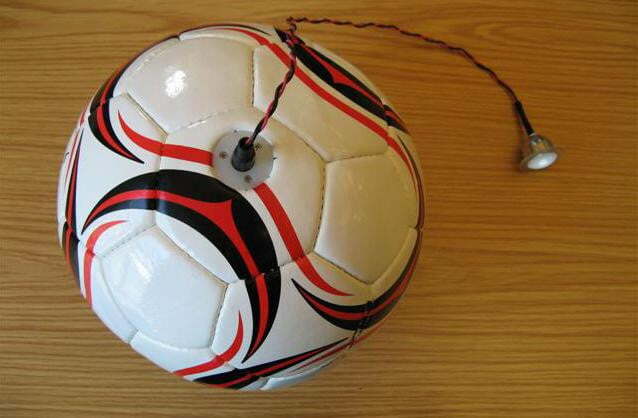 Using an induction coil fitted into the centre of it’s construction, the Soccket contains a magnet, which rapidly oscillates when the ball is in motion. This oscillation powers a motor, and the electricity is stored in an on-board battery. An AC Adaptor is fitted behind one the panels of the Soccket, allowing a multitude of appliances to be powered in such a manner, though the designers – Jessica Lin, Julia Silverman, Jessica Matthews, Hemali Thakkaras and Aviva Presser – envision it’s best use is to charge mobile phones and power lights. While we’re sure that American soccer fans are psyched by the idea of a ball that could also power their iPhones, the students hope that this ball might serve a more humanitarian purpose. In poor countries where electricity is a rare luxury, soccer often attracts near-religious devotion from the vast majority of the populace. Not only do people turn out for every match and idolize the big names of the sport, they also spend significant chunks of their lives playing the game wherever and whenever they can. The Soccket ball could be used to harvest energy from these impromptu soccer games that could then be used to power lights or heat sources. Seems beneficial right? We think so too, but more importantly the device has earned some pretty impressive praise from former president Bill Clinton. You can see Mr. Clinton’s thoughts in the promotional clip embedded below. The big question mark with this invention though is how greatly the Soccket’s technological innards affect its performance as a soccer ball. If prospective players are turned off by the added weight of the device’s magnet, it seems unlikely that they will ever adopt it in lieu of traditional, low-tech soccer balls. For that matter, the idea of a ball stuffed full of hard metal components seems like it could be very dangerous for the first person to attempt a header. Sure, it’ll keep the lights on, but does that matter much if you’re nursing a concussion?